This was such an enjoyable lunch! I was starving. It was lunchtime. I didn’t know what I wanted to eat. Open the fridge, close the fridge. Open the freezer, close the freezer. Nothing seemed appealing at all. I’d been having a crazy craving though: asparagus. My family doesn’t love it, so I don’t get it often. I order it in restaurants whenever I can, for that very reason. Ever since I’d sent her that message, I’d been craving it. When I looked in my freezer, I saw I had some in there. I decided to start there and build my lunch from the ground up. I threw my asparagus in the cast iron skillet. Opened the fridge (again) to see what else was there. Half a tomato. That works. I chopped that up and once my asparagus was almost cooked to perfection, I threw the chopped tomato in and sauteed it in with the asparagus for the last few minutes. I toasted my new favorite kind of bagel: honey oat and added some I Can’t Believe It’s Not Butter on top. 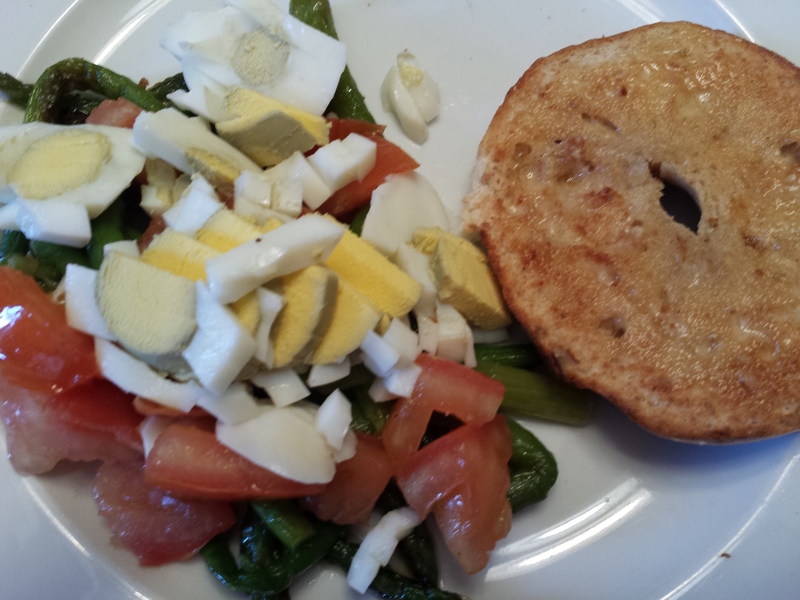 I thought my lunch was complete and I couldn’t wait to eat it, but then I remembered a friend had posted a photo of a meal that included eggs and asparagus. Her eggs were sunny side up, but I had hard boiled in my refrigerator (I almost always do) so I decided just to chop that up and throw it on top. It was a most enjoyable, relatively healthy lunch! I showed one of my daughters with a more adventurous palate, and she declared that it did in fact look delicious and that in the future she’d like to try it herself, subbing in spinach for the asparagus. So although it’s not a true dinner, this could be a healthy side dish or a breakfast for dinner meal, or as I had it for a lunch.